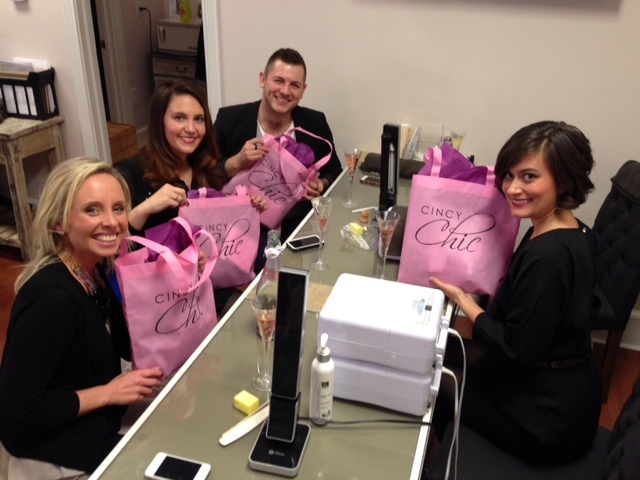 Cincy Chic’s SEVENTH Anniversary Party Re-Cap! My Chic team! (left to right) Drew Ross, Stephanie Zastawa, me, Gwendolyne Rodriguez, and Kerry Francis! So…. my little dream of Cincy Chic not only became a reality and survived an amazingly craptastic economy… we turned SEVEN last week!! Can you believe it?? The super cute spread Cincy Style Bar had for us! Of course, that gave me and my Chic team reason to celebrate, and celebrate in style we did! 🙂 I went with a Marilyn Monroe “Seven Year Itch” theme on the invites to staff… “celebrating seven years, and an itch to be even more fabulous this year!” Our first stop was at Cincy Style Bar to get glammed up for the occasion. I love love love hosting events there. 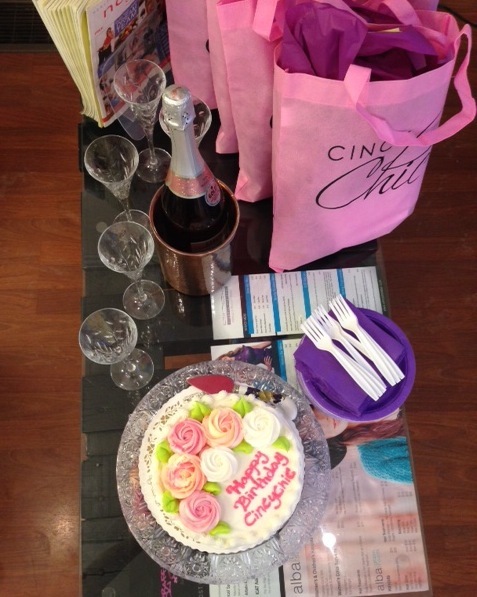 They just think of everything… they had colorful balloons, champagne chilling and a personalized cake waiting for us when we walked in! And of course, our nails and blowouts looked FAB after they worked their magic! The staffers opening presents after getting shellac nails and blowouts! 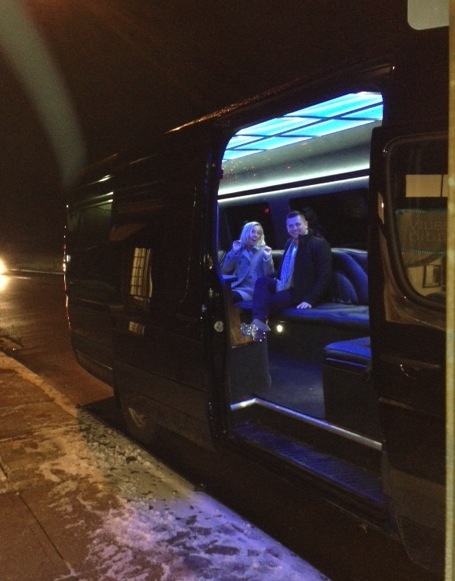 Then, I had Elements Limousine Service pick us up in their new party bus at the salon and take us to CRAVE Restaurant down on the Banks. I wish I would have told the driver to take a scenic route because we had SO much fun on the bus! It had two large TV screens, room to walk and dance around, and an amazing sound system! But, within a few minutes, we were at CRAVE, and boy were we hungry! So, we loaded up on apps, entrees and yummy cocktails. Since I have a bun in the oven (woohoo! ), I thought I’d just be doing water for the night but the server told me about this amazing “Cranberry Bubbles” virgin cocktail with fresh cranberries, ginger ale, thyme, rosemary and other fresh herbs. It was SO delish! The favorite among the drinker Chic’ers was the “Sweet Heat” martini with Bacardi Dragon Berry, white cranberry, mango, jalapeño, and St. Germain. After dinner, I invited all our Cincy Chic columnists to meet the staffers, because with us being an online publication, many of them had never met before! 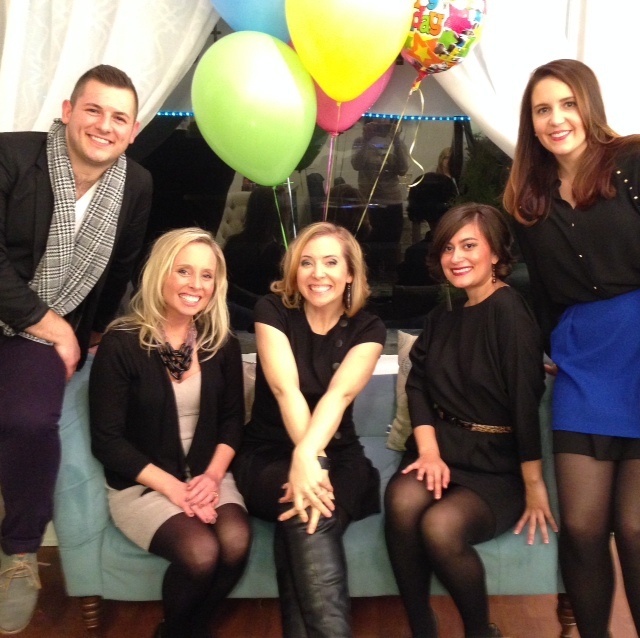 It was neat to have everyone together and thank them for all that they do to make Cincy Chic special…. toasting to seven successful years and the best one yet to come! And thank YOU for reading! We wouldn’t be able to do what we do without your support! Get ready for an exciting year ahead because we have a Chic seven year itch to be even more fab in 2014!!! Previous PostSJP Collection By Sarah Jessica Parker to Launch at Nordstrom February 28!Next PostFab Finds, Upcoming Cincy Chic Event at A Village Gift Shop!